You can never go wrong with flowers. Real or piped with silky smooth Swiss buttercream. Flowers never disappoint. 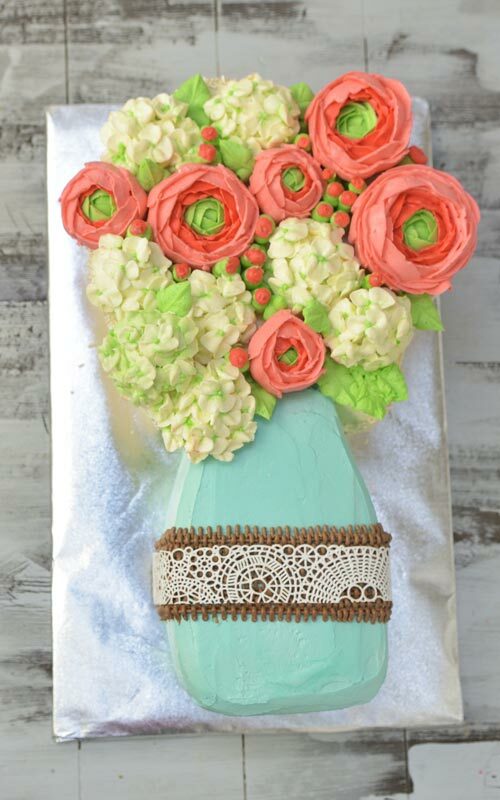 This beautiful Mason jar cake with buttercream hydrangea and ranunculus flowers is perfect for number of celebrations. Birthdays, parties, Mother’s Day or Spring. Ranunculus flowers grow in a wide range of colors. I decided to use peach and bright green. You can use readily available peach food coloring or make your own shade by mixing together pink and little bit of orange. Make sure to mix 2 shades of peach. One lighter than the other. As far the green goes you can use leaf green and add a touch of yellow to it. Today I’m going to use petal tips to pipe Ranunculus flowers. 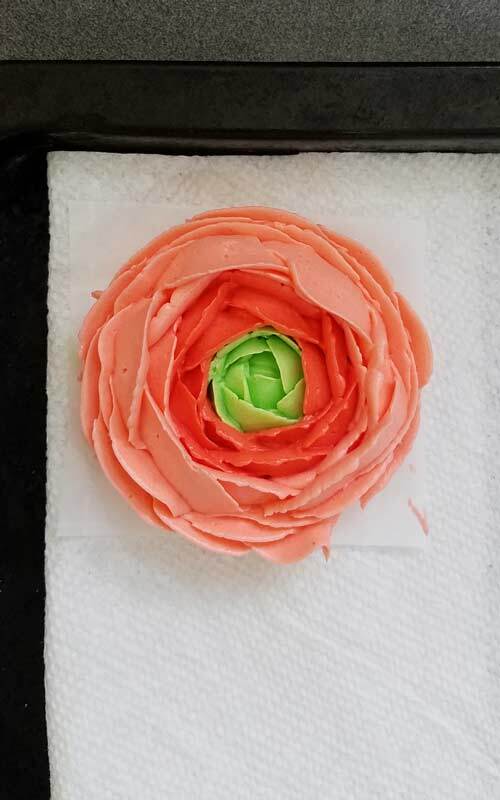 Center is piped with green buttercream (tip #103) and inner petals are dark peach and outer petals I made with the lighter shade of peach (tip #104). Shading gives them a bit more real looking. Be sure to watch the tutorial below on how to pipe these. I absolutely love Hydrangea flowers. We have a hydrangea bush just outside by the side door. In early June it turns into a giant blooming ball. Bush is covered with pink bluish flowers with just the right amount of purple tint. 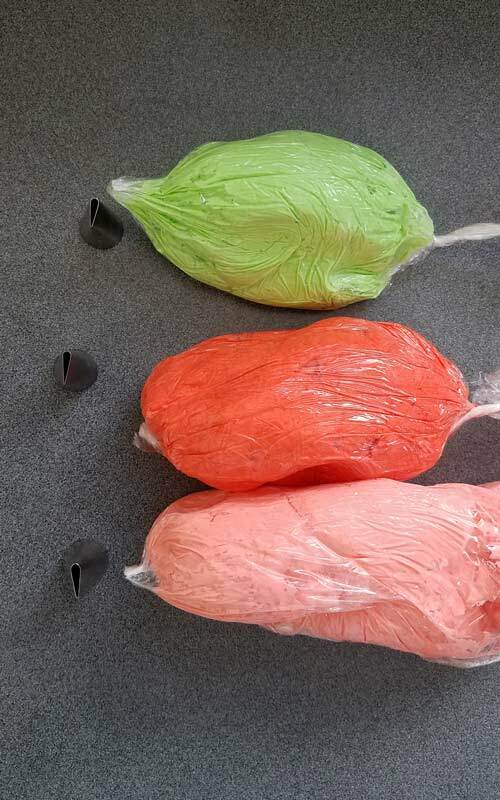 I made my Hydrangea Meringue Cookies in these exact colors. They are gorgeous. 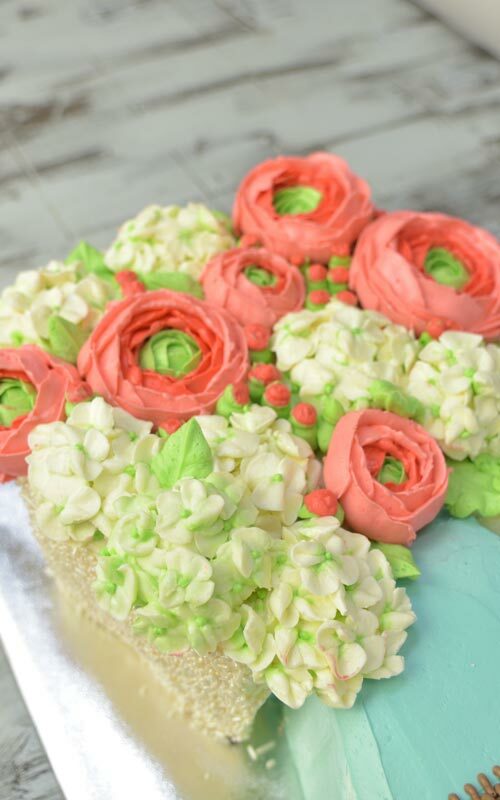 To compliment my showy ranunculus flowers I decided to make hydrangea with cream and bright green buttercream. I used tip #103 to make the petals and tip#102 to make the center dot. For both of the flower you need to use a flower nail and parchments squares. 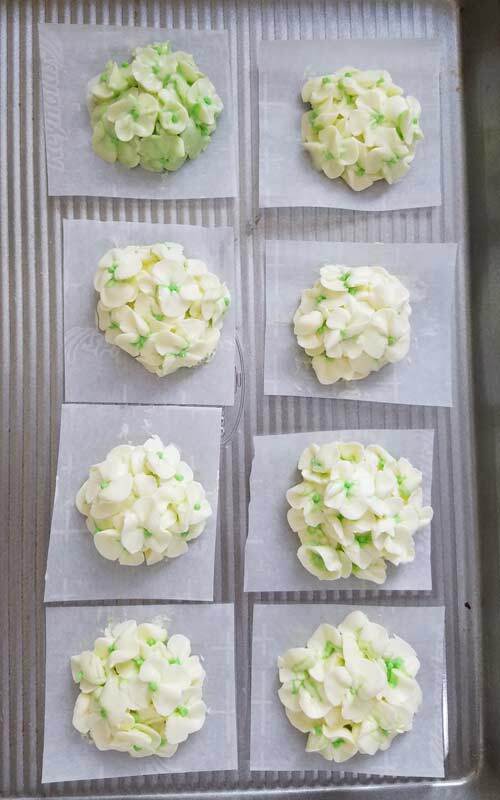 Before you can adorn your cake with pretty buttercream flowers you need to freeze them for an hour or so. Once frozen solid you can remove the parchment square and use them to decorate the cake. Attach them onto your cake using little bit of soft buttercream. 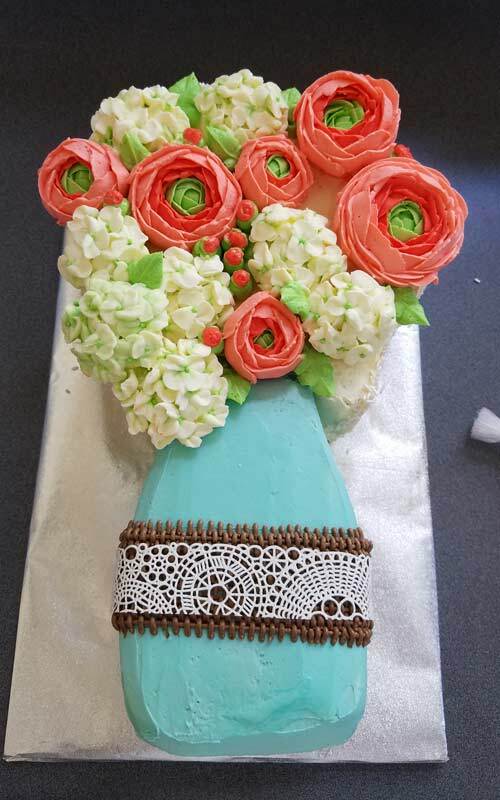 When working with frozen buttercream flowers, try to work fast. If you notice that flowers are become softer place them into the freezer for 10 minutes to firm up. 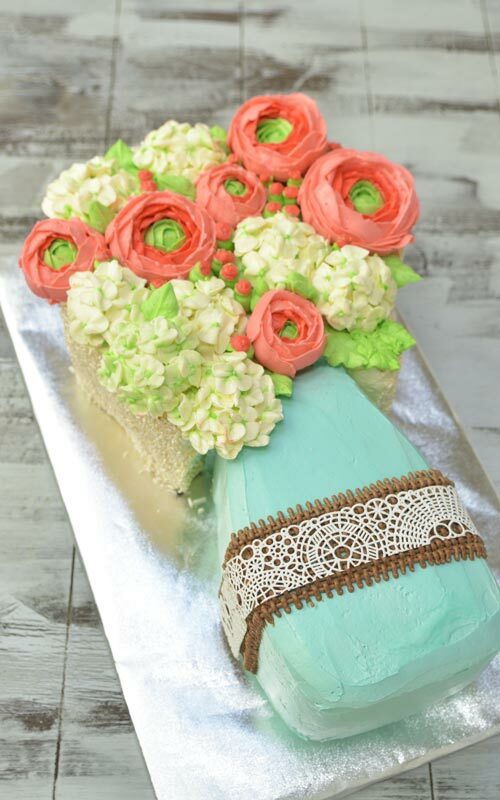 Pretty white lace is made from Sugar Veil icing, using Sugar Veil silicone mold. You learn more about Sugar Veil, how to prepare it in my detailed video tutorial. 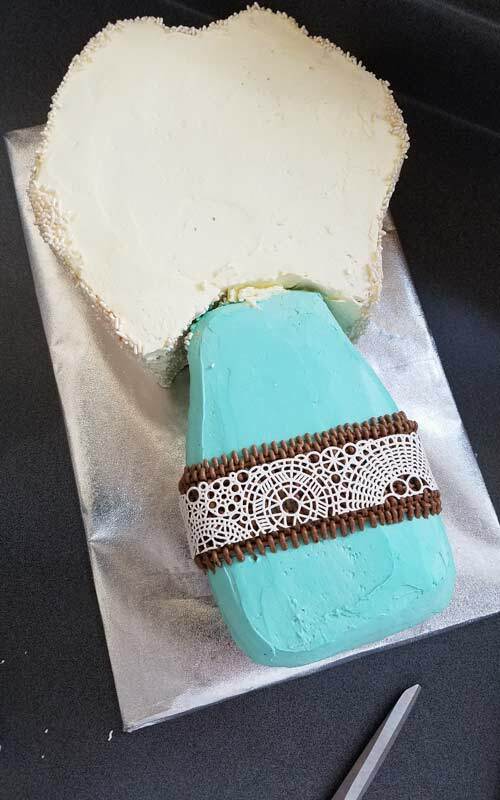 I placed Sugar Veil lace decoration on top of the buttercream burlap design. I used tip # 3 to pipe the burlap. 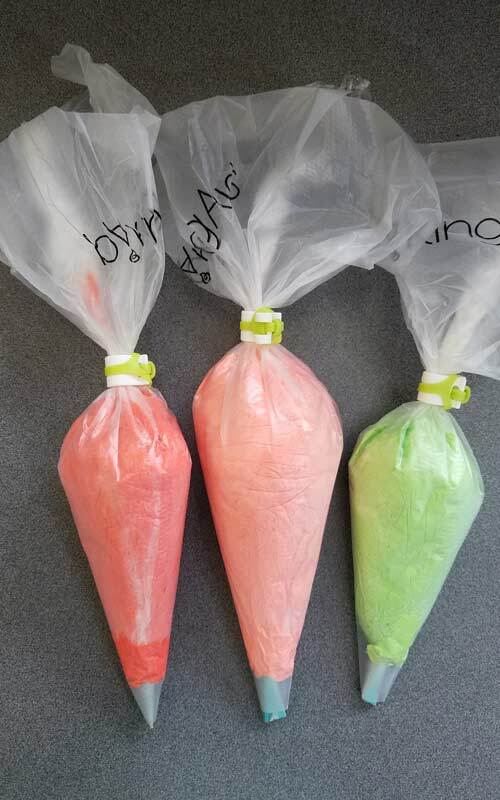 1part granulated sugar to 2 parts water Boil together, after it has cooled add extract of your choice, I like to add vanilla, almond and lemon. I love this so much. Hydrangeas are among my top favorite flowers.